An increasing wave of original equipment manufacturers in China declared bankruptcy, shut down, or moved out of the country in the second half of 2014, according to state-run media. China’s reputation as “world’s factory” is fading as the industry faces a harsh downturn. Two well-known large-scale original equipment manufacturers—that is, companies that make products that are then sold under another brand—in Suzhou City in China’s southeastern Jiangsu Province tumbled down in December, state-run China National Radio reported. Taiwan-funded United Win Technology Limited in Suzhou announced their bankruptcy on Dec. 5. The company once had over 20,000 employees during its high time. Only 3,000 employees were left at the time of bankruptcy. The company once worked for Apple Inc. and then for Chinese smartphone company Xiaomi Inc. for a few years. China’s cost of labor is rising due to inflation. Silitech Technology in Suzhou, also a Taiwan-funded company, announced its shut down on Nov. 28, 2014, laying off most of its employees. The company, which had over 10,000 employees at one time, mainly produced mobile phone keys for Nokia. As touch screen mobile phones have become more popular, phone key production has been gradually eliminated from the industry. Zhaoxin Communications Industrial Co., a cellphone research, development, and production company, in Dongguan of southern China’s Guangdong Province not only went bankrupt, but its chairman also attempted suicide. On Jan. 4, a high-level executive at Zhaoxin Communications confirmed the attempted suicide of chairman Gao Min, state-run Southern Metropolitan Daily reported. “As you know, under the impact of the overall environment, many enterprises at the Pearl River Delta have carried a lot of triangular debts and the cash can’t flow,” the anonymous high executive said. Gao was still being rescued at the time of the report. At least three tablet PC manufacturers in Shenzhen City in Guangdong Province announced bankruptcy in the second half of 2014, including the Keen High Technology company, know for it’s high quality production. Only in October last year, over 10 large shoe factories in Dongguan City also went bankrupt, according to state-run media. Industry insiders estimated that at least over 100 large factories would go bankrupt or shut down by the time of the Chinese New Year in February, state-run China Times reported. Also, the increasing cost of labor has diminished China’s production-cost advantage, playing a key role in the manufacturers’ bankruptcies. 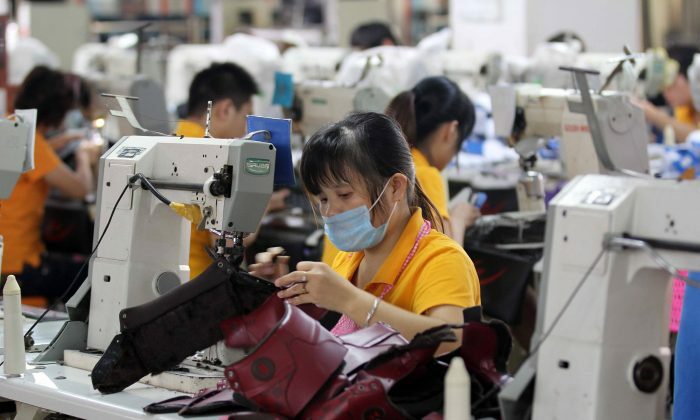 Professor Frank Tian Xie, at the Business School of the University of South Carolina told Epoch Times that “China’s cost of labor is rising due to inflation,” which will cause the bankruptcy of more manufacturers, withdrawal of foreign investment, and widespread unemployment. Many of the bankruptcies have sparked large protests of laid off employees calling for their delayed payments and bonuses. “After abrupt bankruptcies, there are a large number of [unemployed] people in society. It’s difficult to solve all of the employment issues in a short period,” an official in Suzhou City told China Times. Economist Roy Chun Lee told Deutsche Welle in October that China is no longer the world’s factory anymore. Many Taiwanese companies have withdrawn their investments in China, and more companies from other countries, such as European enterprises, will follow suit due to the rising cost of labor in China, Lee said.